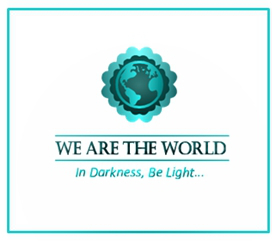 Today, I’m happy to join others in We Are the World Blogfest – promoting positive news on the last Friday of each month, and, in our sharing, increasing the light quotient in the world. Our special lead co-hosts for this month are Belinda, Inderpreet, Mary, Peter, and Simon. You can sign up here, and do check out the other bloggers participating as well. Today, the last Friday in April, also happens to be National Arbor Day in the United States. It feels like the perfect day to introduce Clare Dubois, founder of the TreeSisters organization. The vision of TreeSisters organization is ”a world in which it is normal for everyone to protect and restore our planet.” They speak a lot about the urgent need for humanity to shift from a consumer species to a restorer species. Their mission is two fold, and like all big paradigm-shifting visions, it’s BIG, it’s bold, it’s inspiring, and it feels absolutely do-able. TreeSisters is committed to “rapidly accelerating tropical reforestation by inspiring and channeling women’s nature-based feminine leadership into local and global action.” Doing so improves the environment by protecting and expanding forests, restoring and protecting watersheds, controlling soil erosion and restoring topsoil and land fertility. It simultaneously is a women’s empowerment initative – fostering women’s participation, improving community livelihoods and forest interdependence, improving incomes. But I also absolutely encourage you to visit their website for more in-depth information. Let’s plant more trees and empower more women, and together make this a better world. I love this idea. Probably because I’ve been thinking all week about how we’re going to plant more trees in our backyard/forest. Nothing as paradigm shifting as these women are proposing, but along the same lines. Good story for #WATWB. Oh what a wonderful project to be thinking about Ally – how exciting! 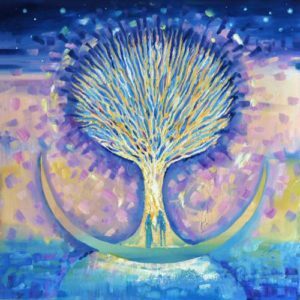 Plant more trees wherever one can – providing nutrients for the soil, shade for the weary soul, a trunk to lean on, a child to make a tree house – lovely post thank you Deborah! Yes to planting more trees Susan – they bless us in so many ways. So true Belinda. I’m really embracing that term “restorer” – it feels like such an empowered way to navigate. And thank you for co-hosting #WATWB – what a wonderful thing. And what a glorious day to be outside playing in the dirt! It is up to us to make sure that Mother Nature continues to nurture us all…come rain or come shine! And as I was contemplating what to add to my garden this year, a friend dropped by to gift me an EXOTIC ANGEL PLANT…Luna Croton! And yes, plants make us feel better! We are all connected, and as such, our light shall continue to shine bright as long as we feed the soul with authenticity! Oh Vicki what a fabulous gift. I don’t know the Luna croton, but it sounds right up my alley. 🙂 Wishing you many hours of enjoyment with your hands in the dirt, your eyes on the beauty, and your heart in the garden and woods. I love the name of this group – so perfect. And their work is inspiring to say the least. Thanks so much for sharing. Great to meet you thanks to this blogfest! So nice to meet you as well Julie. #WATWB is a brilliant thing on so many levels! Wishing you a happy Arbor Day and a wonderful weekend ahead. Thank you for visiting me.I like what you write here, so will be following you, now. Indeed, we are the world. “BE the change.” Peace. Thanks for the kind words Annie. I’m glad we’ve connected. And I wish you much peace as well. Reforestation is absolutely so important for many reasons, not the least being to prevent soil-erosion. Now is a perfect time to raise this awareness. Everyone’s aim should be to protect and restore the only Earth we have. Yes absolutely Gail. And now is the time indeed. Great post; trees (and other plants are essential). We exhale carbon dioxide; they inhale it and give us back oxygen. Thanks for stopping by John. Our existence and that of the plant kingdom are woven together in such amazing ways aren’t they? I’ve planted a few trees in my time. It is a very satisfying endeavor. Good for TreeSisters! Some activities really do feel especially satisfying and I feel that way about planting trees. I love Arbor Day! When the boys were in elementary school, they often came home with a tiny tree to plant. Most of the time, it didn’t make it, but I loved helping them plant it and the message it sent. What a fun thing for kids – and you too! I wonder how many trees the National Arbor Day Foundation has been responsible for planting. I was amazed that in 1872, the first Arbor Day, more than one million trees were planted in Nebraska. TreeSisters is the perfect name for this organisation! Females are the primary nurturers, so it makes perfect sense that we take the lead in this initiative. Several studies have identified a relationship between the natural environment and improved health outcomes. A natural experiment, was used to test whether a major change to the natural environment-the loss of 100 million trees to the emerald ash borer, an invasive forest pest-has influenced mortality, in terms of cardiovascular and lower-respiratory diseases. I’m not at all surprised by the studies. While we tend to think of trees in terms of the environment, we don’t really talk very much about the direct benefits to humans. Trees are far more important than most people understand. I appreciate you stopping by Michelle – thanks. I imagine the life sciences course is wonderful Hilary, and I look forward to some more sharing from you about it. Here’s to the trees and all they bring us, and all those dedicated to their care and flourishing. I love #WATWB – so much goodness to be witnessed and acknowledged! Thanks so much for stopping by. Hi Deborah thanks for sharing this: trees are close to my heart, and I hope to be able to plant some before I’m gone. That would be wonderful Damyanti – there’s something so rewarding about planting trees. It feels like a gift on so many levels. Thanks for stopping by Simon, and for co-hosting #WATWB. Yes, yes, yes, to more tree power!